Various sizes available to accommodate different thread weights. 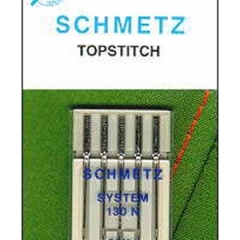 This needle has an extra large eye and a large groove to accommodate topstitch thread for decorative or edge stitching. Sizes 100 and 110 are highly recommended for use with Aurifil’s 12 wt cotton or 12 wt lana wool threads. Size 90 is best suited to 40 wt and 28 wt cotton threads.